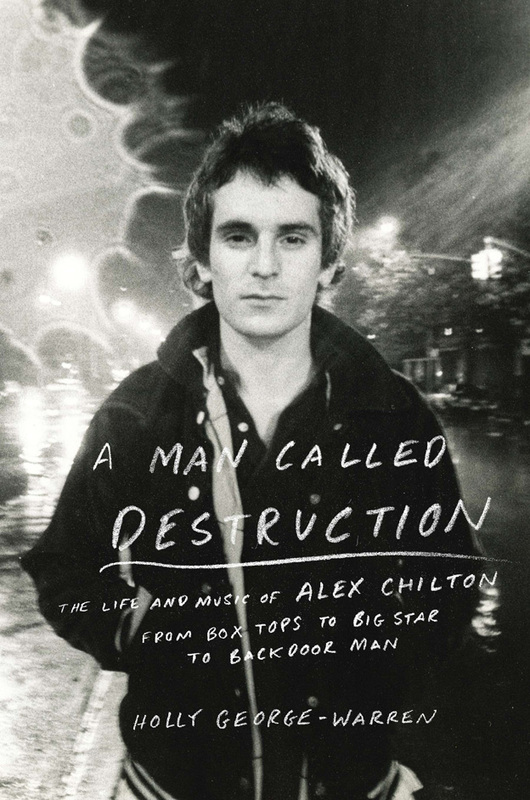 1) Holly George-Warren: A Man Called Destruction–The Life and Music of Alex Chilton from Box Tops to Big Star to Backdoor Man (Viking) I am a mass devourer of pop music tomes, but also a bit of a Chilton skeptic: even the brilliance of the best Big Star material is largely attributable to Chris Bell, and too much of the man’s notoreity is connected to things other than music. But George-Warren not only makes a great case here, taking the reader behind the scenes to bedroom rehearsals, bent late-night studio experiments, eccentric apprenticeships, and a long, disciplined, sober road to demonstrate Chilton’s hands were on the wheel more often than reported–even when he was barely conscious. More important, she shapes meticulous research (oh, to have grown up in the Chilton home!) into breezy and fascinating narrative, and balances that with insight into the making of the music. Plus, she passes my first test of good music books: her book sends you racing back to the music (the proof of which you will see in this week’s entry). In fact, my Brit Lit class enjoyed a Big Star block party today while they worked on their writing portfolios. Note: it does share something significant with a recent Zevon tome— this was a guy who, despite his charisma and multiple connections, was very, very lonely. 3) Doris Duke: I’m a Loser–The Swamp Dogg Sessions (Kent) Jerry Williams, Jr., is one hell of a producer, songwriter, and bandleader, but seldom did he oversee someone else’s record that topped his own eccentric and piquant output. Working with luminaries like Irma Thomas and Gary U. S. Bonds, he wrote nice material and created solid settings, but somehow the artists didn’t catch fire. Not true on these 1969 recordings with one of soul’s great lost treasures, Miss Duke from Sandersville, Georgia. She rises to the occasion of great Dogg titles like “Ghost of Myself,” “Divorce Decree,” and “To the Other Woman (I’m the Other Woman,” selling them with a smoky, soulful, very country authenticity that’ll make you wonder why she didn’t become a star (I’d argue, a late start in the soul game). 7) Neneh Cherry: Blank Project (Smalltown Supersound) 20 years after she knocked the world on its ear as a young mother and avant garde progeny in a buffalo stance (that single STILL sounds marvelous), Ms. Cherry, fresh from fronting a free jazz record–not an easy VOCAL task–has issued this equally challenging project, where her still free-inflected vocals dart and linger in and around extremely crisp and deep trip-hop inflected tracks. It’s hard to judge it, because I haven’t heard much like it, but I have been encountering some age-ism lately, and Cherry’s work is argument against it. 8) Dry Wood (directed by Les Blank) and Bury the Hatchet (directed by Aaron Walker) One old, one new doc out of Louisiana, the former about Creole culture (specifically, music and food) in Mamou, the latter about NOLA Mardi Gras Indians (specifically, Big Chiefs Alfred Doucette, Victor Harris, and Monk Boudreaux). Both films are beautiful and do what they set out to do and more. But they are most striking in capturing Americans making and building (also, unfortunately, rebuilding) things themselves–they will strike you across the face with what you are missing out on. VERY, VERY highly recommended. 9) Allen Toussaint: Life, Love, and Faith (Four Men with Beards Reissue) Toussaint’s mild, almost shy singing causes some listeners’ minds to wander, but here it’s backed by the original version of The Meters (notably including the drumming of Ziggy Modeliste, which is always interesting by itself) and some of the best tunes and arrangements Allen ever wrote for himself. Quietly and seductively funky, in the New Orleans way. 10) Fats Waller, 5:15 a.m. on a Saturday morning. Scrambling to get it together to meet my Science Olympiad crew at 6:30 at the local university, my stressors were vanquished when my wife Nicole got the right medicine out of the cabinet. If the world is too much with you, if you can’t pry your mind from lost planes, corporate control of your country, the frustrations of your job (if you even have one), or absent friends or family, let the mischievous Mr. Waller remind you that life is too important to be taken seriously. His deft command of the 88s, his phrasing-with-a-wink, his jaunty rhythm, his raffish charm–what more can you ask for to lift your tension?